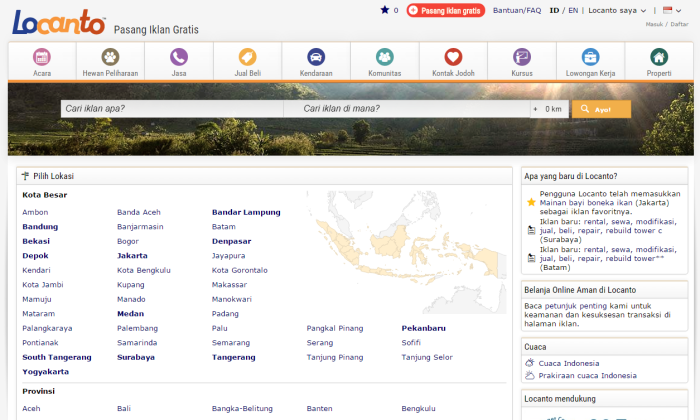 Locanto Classifieds has released a Bahasa Indonesia version of its Indonesian website. The new website complements the existing English edition of Locanto Indonesia, which launched two years ago. Despite low internet penetration, Indonesia is one of the world’s largest online markets, owing to its sizable population, he said. According to Statista, Indonesia currently ranks eighth in the world in terms of internet users. Browsing and posting ads in Bahasa Indonesia is free. Launched in 2006, Yalwa GmbH is a privately-owned internet company focused on connecting locals with the information, goods and services they need on a daily basis. Yalwa operates three distinct internet platforms: Locanto, a full-service classifieds; Yalwa, a local business directory; and askalo, a Q&A website for local information sharing. Yalwa offers its services in 65 countries, and in six languages. A bunker-like environment, constructed from sand bags, with blacked-out windows, will server as the bar for Absolut during Art Bas.. Some brands are given more credit than its actions merit, while some could do more to tell people about their remarkable CSR progr.. The initiative was launched to fulfil the company's commitment in offering a diversity of digital products and services with add-o..